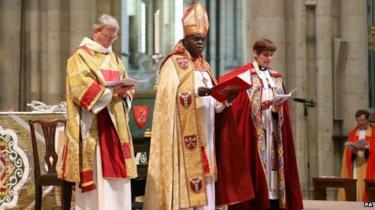 Fashion , Art and Human Statements : The first woman bishop in England. The first woman bishop in England. 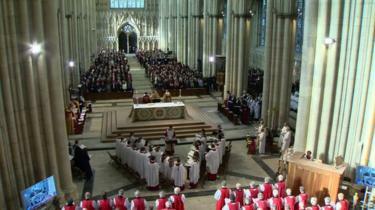 The Church of England is consecrating its first female bishop during a ceremony at York Minster. The Reverend Libby Lane, 48, is being ordained as the new Bishop of Stockport, in what she says will be a "profound and remarkable moment". The Church formally adopted legislation last November to allow women bishops. The move, which ends a centuries-old tradition of exclusively male bishops, has continued to prompt divisions between some Anglicans. Mrs Lane has been vicar of St Peter's Hale and St Elizabeth's Ashley, in Greater Manchester, since April 2007. Her appointment was announced last month and Monday will see the consecration, or the process of being made holy, take place.